Sprightly little nipper. The Prestigio MultiPad 7.0 Prime Duo (PMP5770D) is contending against reputable names and renowned opponents among the 7-inch tablets: Apples iPad Mini, RIMs BlackBerry PlayBook, the Google Nexus 7, and the tablets Kindle Fire and Kindle Fire HD from Amazon. The question is whether the 7-inch tablet with a sharp IPS display and a dual-core processor for 150 Euros (~$195) is able to assert itself? 7-inch tablets are the most popular product with consumers at the moment, while at the same time this market segment is bitterly contested by manufacturers in terms of price. In addition to this Amazon and Google have set the bar very high for the remaining competitors with their Kindle Fire, Kindle Fire HD and Nexus 7 tablets, which are bestsellers. While the Blackberry PlayBook is so far having a bit of a hard time, Apple's iPad Mini is now a further popular choice. New tablet models, such as the Prestigio MultiPad 7.0 Prime Duo (PMP5770D), will have to be able to contend with all these devices. Furthermore, there are also a whole series of affordable entry-level tablets with Android as their operating system, with display sizes between 7 and 8 inches from other manufacturers including Archos, Arnova, Coby, Odys and VCM. 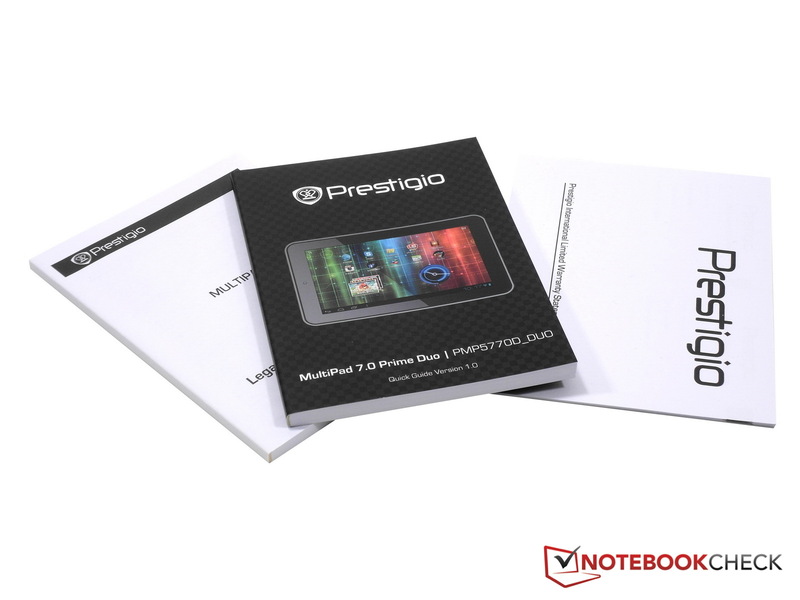 On paper at least the Prestigio MultiPad 7.0 Prime Duo is able to keep up compared to the competition: As much or more storage capacity as the iPad Mini, Kindle Fire, Kindle Fire HD, Nexus 7 or the PlayBook. Moreover the Prime Duo is also thinner than Kindle and Co., and is also the cheapest and lightest tablet in this pool at 150 Euros (~$195). The system on a chip in the Prime Duo is based on the previously less well known dual-core ARM Cortex-A9 MPCore Amlogic AML8726-MX with Mali-400 MP2 GPU that operates at 1.5 GHz. 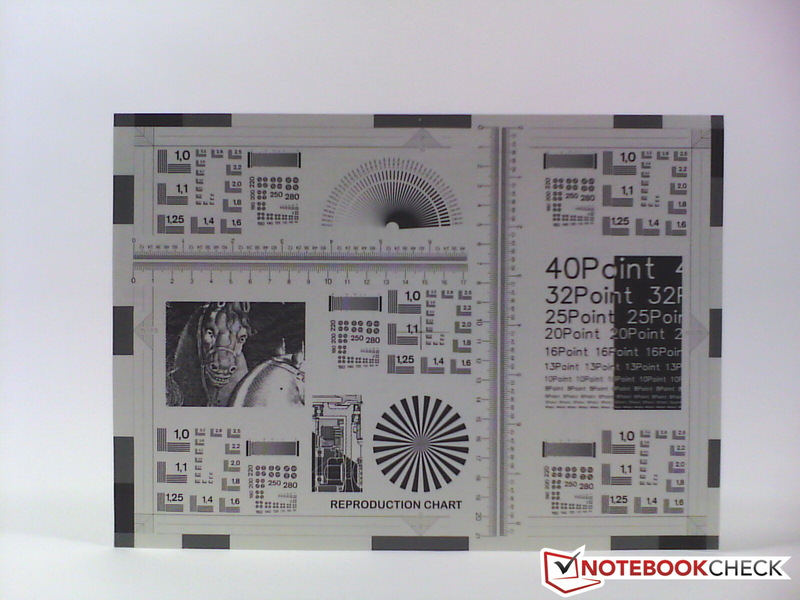 The Prestigio MultiPad PMP5080B previously tested by Notebookcheck still had a single-core RK2918 processor from RockChip. How well the AML8726-MX fairs against renowned SoCs from competitors such as Texas Instruments (OMAP 4430, OMAP 4460) or Nvidia (Tegra 3), and how much of an effect this has in practice, can be discovered in this review. 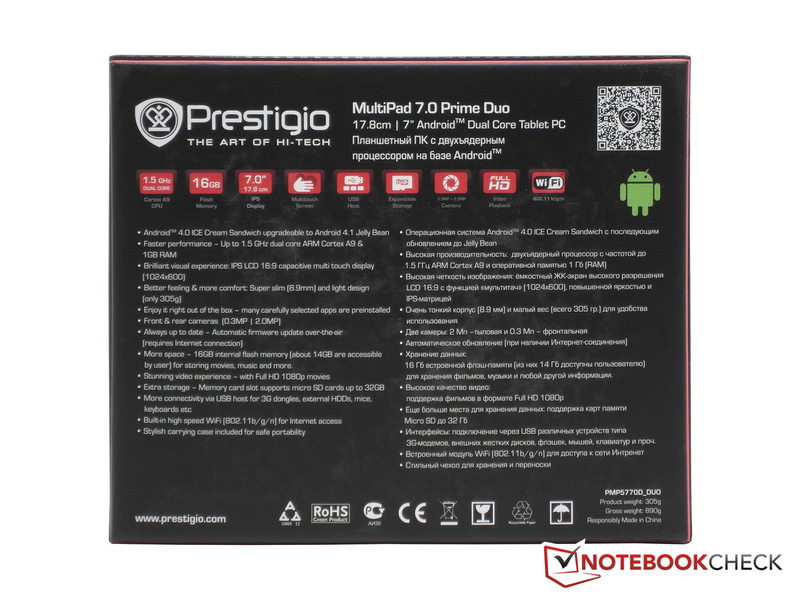 The Prestigio MultiPad 7.0 Prime Duo belongs among the thinnest and lightest 7-inch tablets on the market in the price segment up to 200 Euros (~$260) with its dimensions of 191 x 120 x 8.9 millimeters (~7.5 x 4.72 x 0.35 inches) and weight of 305 grams (~0.67 pounds). With its height of under 9 millimeters (~0.35 inches), the MultiPad is only undercut by more expensive tablets such as Apple's iPad Mini with 7.2 mm (~0.28 inches) or the Toshiba AT270 with 7.8 mm (~0.31 inches). Kindle and Co. are thicker and are not able to keep up. 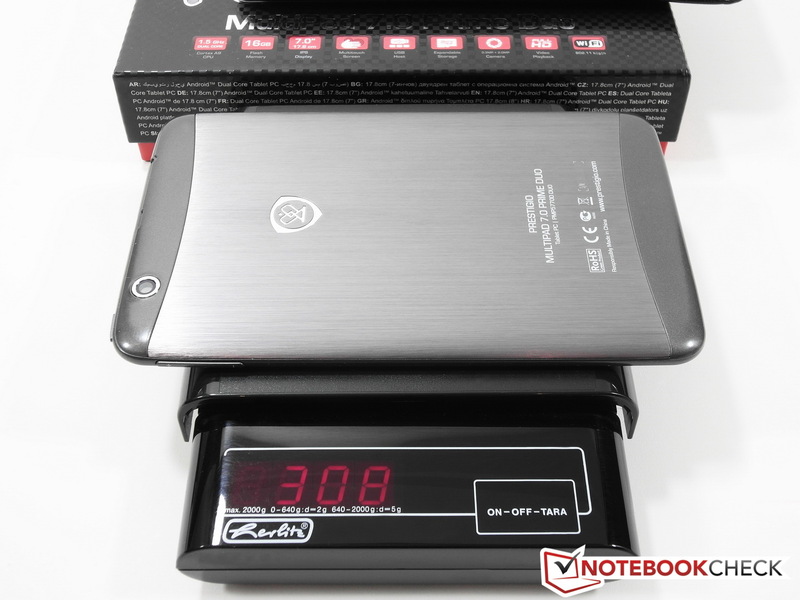 While checking the weight during the test, the Prestigio tablet turned out to be an additional 3 grams overweight: We measured 308 grams (~0.68 pounds) as with the iPad Mini, instead of the 305 grams quoted by the product documentation. The Kindle Fire at 400 grams (~0.88 pounds), Kindle Fire HD at 395 grams (~0.87 pounds) and Nexus 7 at 340 grams (~0.75 pounds) are all substantially more hefty anyway though. Compared to this the BlackBerry PlayBook can almost seem like a heavyweight with its 425 grams (~0.94 pounds). When unpacking the Prestigio MultiPad 7.0 Prime Duo you never get the feeling - either optically or haptically - that the device is made of cheap plastic; unlike with most cheaper tablets from Asia in the price segment (up to 150 Euros/~$195). On the contrary, the PMP5770D is perfectly balanced in the hand and immediately feels comfortable. 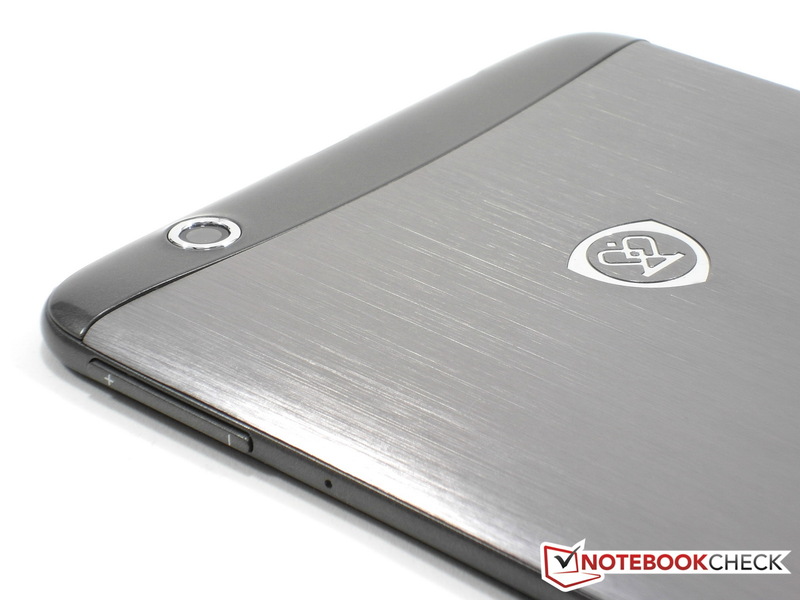 The elegant brushed aluminum back plate with chrome edges around the camera, and the etched Prestigio logo, both look fantastic and feel quite grippy. As with most of the entry-level tablets at present, the audio socket and micro USB port have to make do without a protective cover. 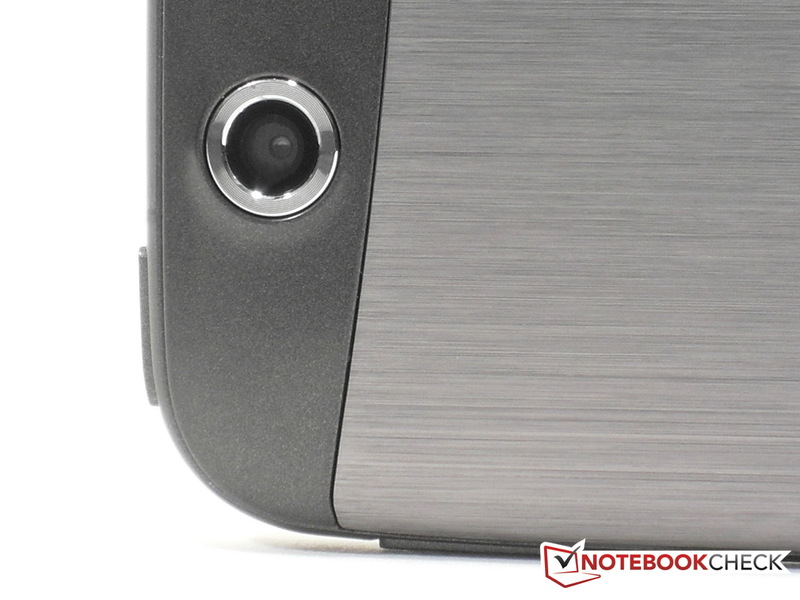 The microSD card slot on the other hand is hidden under the cover with the main camera on the back of the Prime Duo. The power button and the volume controller make a quality impression. All in all the manufacturing quality and materials are impeccable for 150 Euros (~$195). The MultiPad 7.0 Prime Duo uses a dual-core ARM Cortex-A9 Amlogic AML8726-MX processor with a clock speed of 1.5 GHz and has 1 GB of RAM as well as 16 GB of internal storage. Using the SD card slot it is possible to expand the storage by up to an additional 32 GB with microSD or microSDHC cards. The two integrated cameras (front 0.3 pixels, back 2 megapixels), micro USB 2.0 port, WLAN 802.11b/g/n, 3.5 mm mini jack socket, and a 3200 mAh capacity lithium-polymer battery round off the package of the Prestigio tablet. 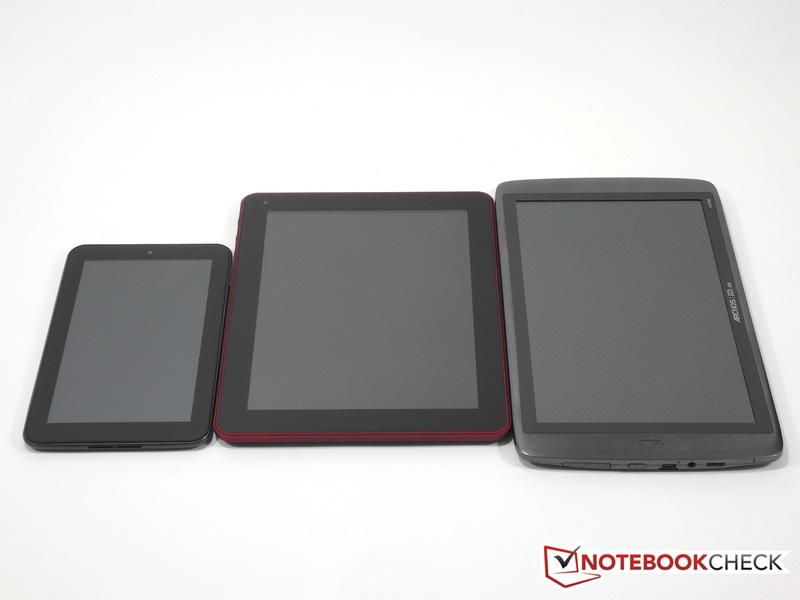 Bluetooth and GPS modules are a less common addition to affordable tablets at present. A high-definition camera or an HDMI port, as well as a digital compass, NFC (Near Field Communication) or even an integrated 3G/UMTS module are also not included in most 7-inch tablets in their current generations. Revered exception: The Google Nexus 7 which has Bluetooth, NFC and GPS; but on the other hand lacks an SD card slot. When it comes to the connectivity features, buyers will almost inevitably have to make compromises in the entry-level segment as things stand. Even the Prime Duo has to make do without Bluetooth, GPS, HDMI or additional sensors. In terms of interfaces, the MultiPad 7.0 Prime Duo has a micro USB 2.0 port and a 3.5 mm mini jack socket for headsets or headphones on the left side (camera side). Also on the same side is the on/off button, and a tiny LED for indicating the battery charge status, which shines red while the battery is charging and orange when the battery is fully charged. In order to reset the tablet, the power button has to be held down for about 10 seconds. Along the long side of the Prime Duo, in close proximity to the power button, there are also the volume controller and the integrated microphone. 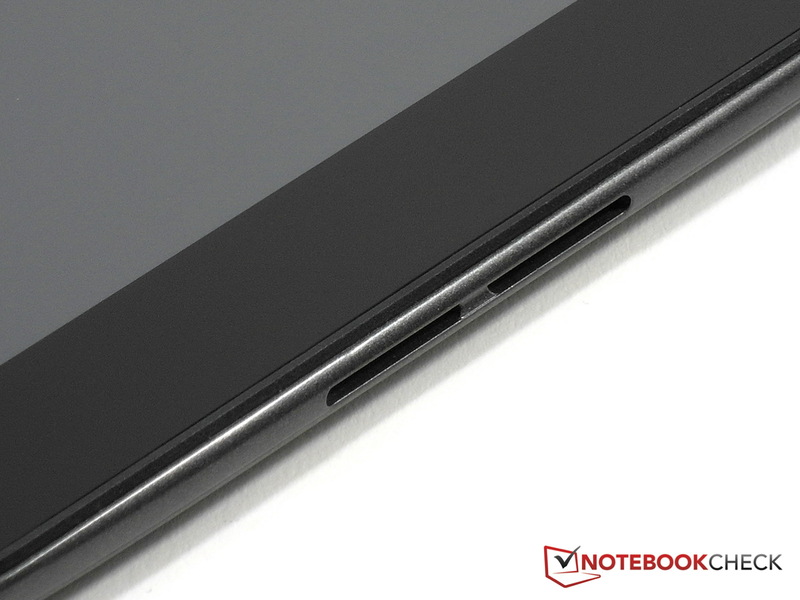 The stereo speakers are located on the shorter right side of the tablet. In order to insert a memory card into the microSD card slot, it is necessary to remove the cover in the area where the main camera is located. The lid can be lifted off with the fingernails; hence a screwdriver is not necessary. Thanks to USB host mode functionality, users are able to use the Prime Duo with an external USB mouse, keyboard, storage or a mobile broadband modem without any problems. We did the test and checked the functions using the included OTG cable. The mobile UMTS broadband modem HSUPA USB Stick MF110 from ZTE Corporation (1&1 Internet) is immediately recognized by the Prime Duo, and a working Internet connection is automatically established straight away. Following the PIN entry and a short wait, things can get started. 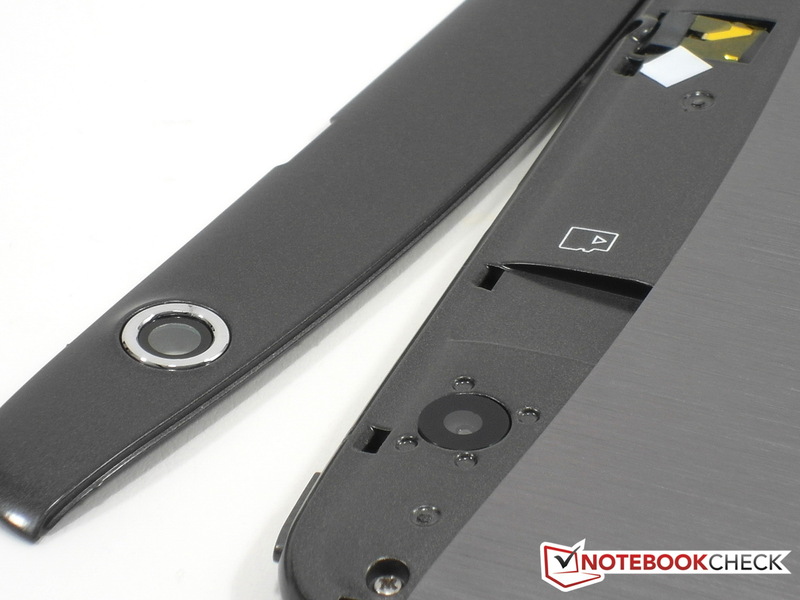 Also the recognition and mounting of an external 2.5-inch hard drive, such as the WD My Passport with 500 GB of storage capacity, worked straight away. A USB mouse and keyboard were also both usable in our test, with the English layout active by default upon connecting the keyboard. 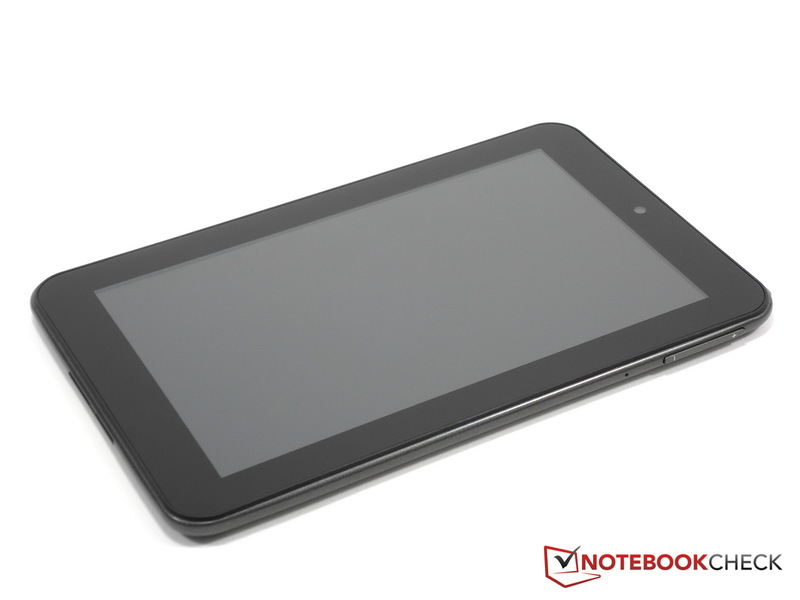 The MultiPad 7.0 Prime Duo (PMP5770D) tablet has to contend with Google's Android 4.04 Ice Cream Sandwich operating system in the test. 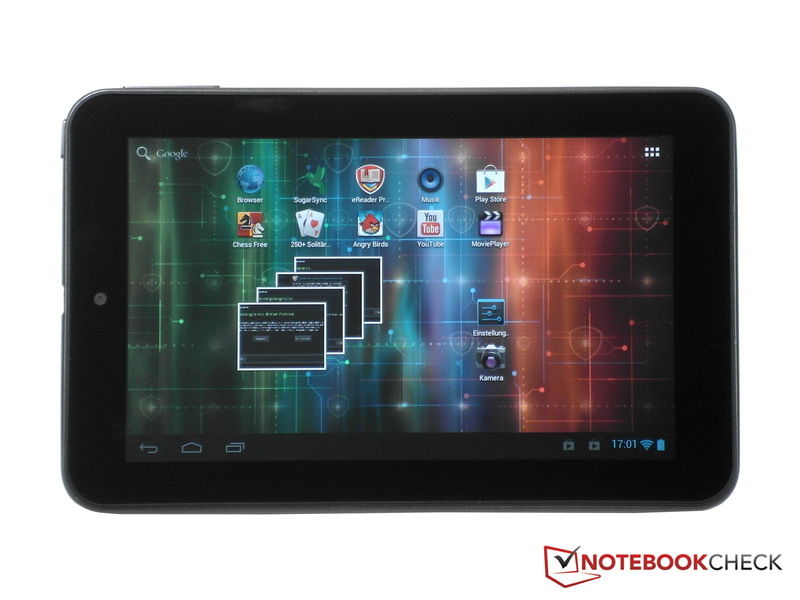 According to Prestigio the 7-inch ICS tablet is also compatible with Android 4.1 Jelly Bean. When and whether there will be an update available is not certain at present. Updates such as firmware and new software are pushed to the MultiPad Over-The-Air (OTA, via WLAN). This does however, needless to say, require an active Internet connection. While other manufacturers, such as Coby for example, forgo the Google certification and the corresponding access to the Android store Google Play, and Amazon's Kindle Fire tablet PCs don't have the usual Android features, owners of the Prime Duo have full access to Google Play. The proprietary user interface (UI) with icons styled accordingly with the Prestigio crest design of the MultiPad PMP5080B tablet, has now been replaced by the standard ICS design for the MultiPad 7.0 Prime Duo. Android 4.0.4 runs smooth and fast on the PMP5770D and is stable. Despite the fact that the MultiPad 7.0 takes more than 1 minute to boot up, the Android tablet can be used in a quick and swift manner without eliciting any crashes or judders. 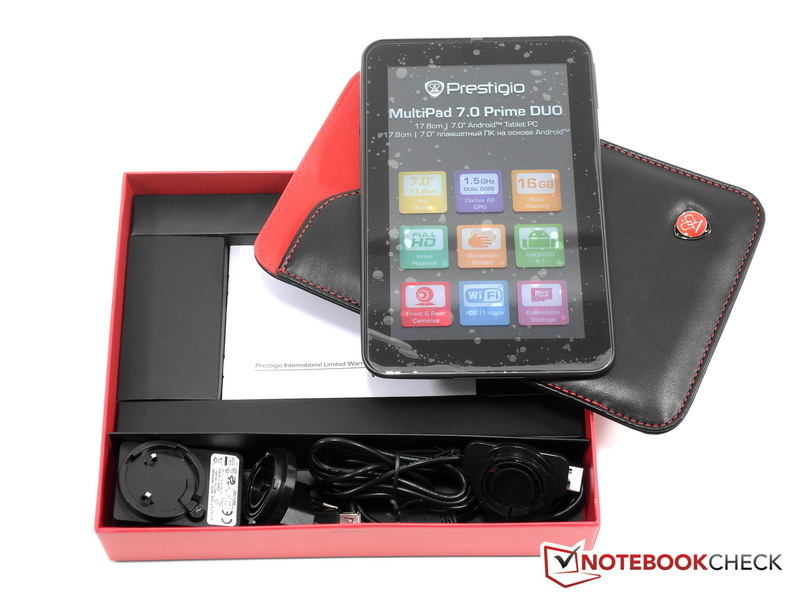 A few proprietary apps and pre-installed games, as well as the Prestigio eReader and Angry Birds, have also not been omitted by Prestigio with its MultiPad 7.0. 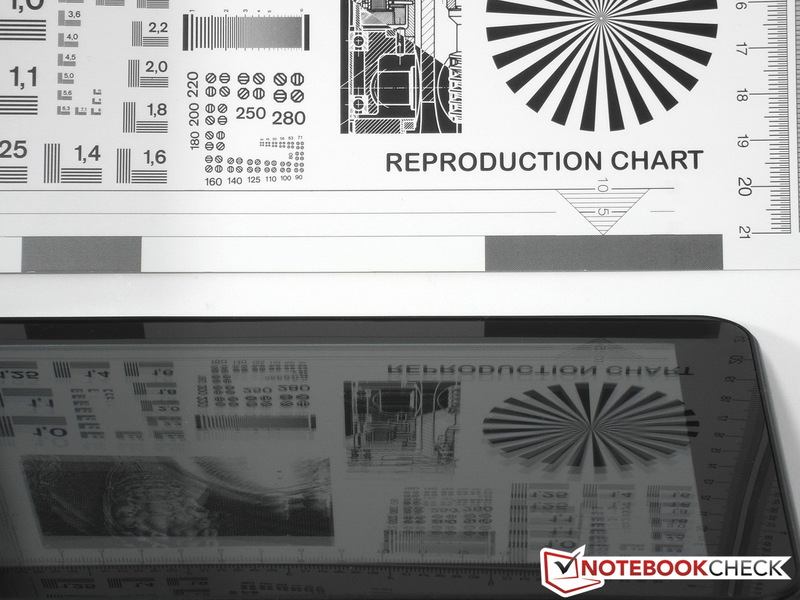 The subject of communication is quickly summed up in the case of Prestigio's 7-inch tablet. The Prime Duo merely provides wireless connectivity via the WLAN standards 802.11b/g/n in the frequency range around 2.4 GHz. When testing the 5 GHz band we weren't able to make a connection. Using the 2.4 GHz band we were able to establish connections immediately with WPA2 and AES encryption, which were stable and stood out with very good reception. 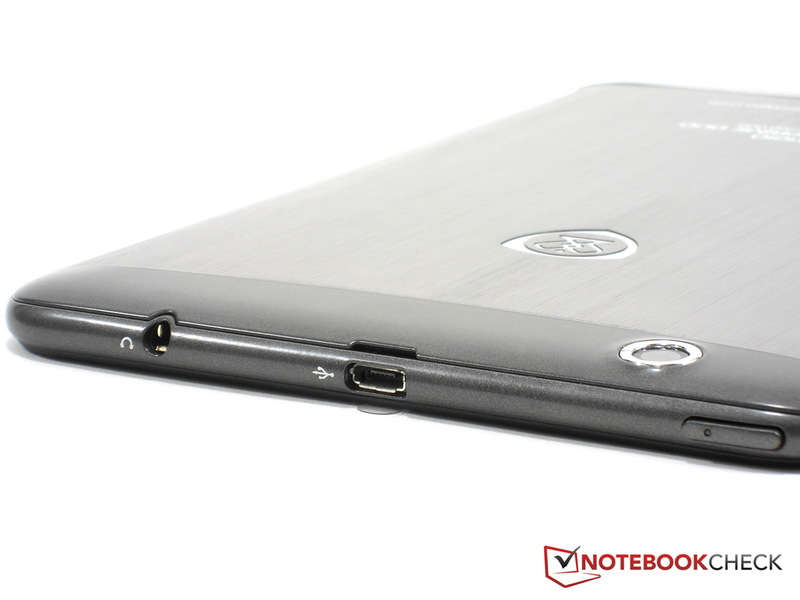 Owners of the MultiPad 7.0 will unfortunately have to make do without Bluetooth or GPS. Instead, we were able to use an external USB mobile broadband modem (MF110 from ZTE (1&1)) for mobile Internet connectivity without any problems. Simple VGA and HD camera modules with plastic lenses from Asia, such as those integrated into affordable smartphones and tablets, only cost between 1 and 2 US dollars these days. High quality cameras with 8 megapixels and better optical quality, such as in the iPhone 5 from Apple, on the other hand cost upwards of 15 US dollars. 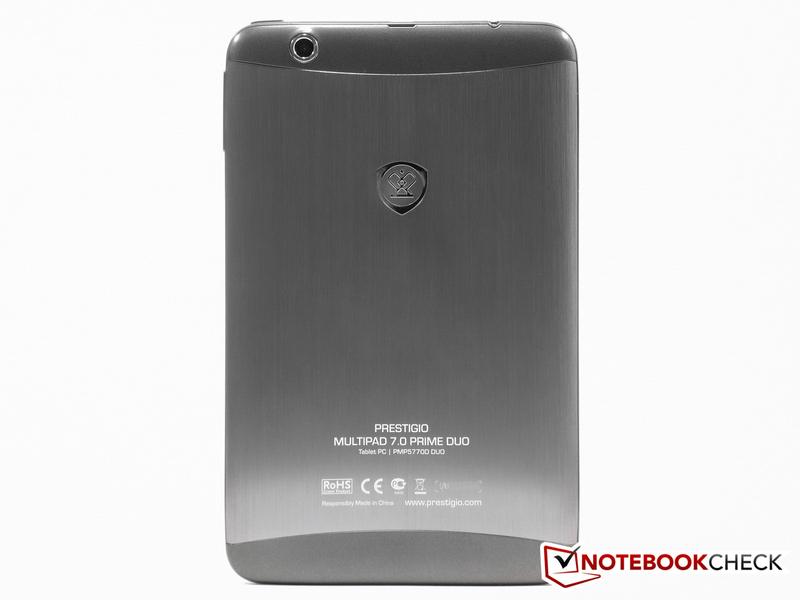 The Prestigio MultiPad 7.0 Prime Duo integrates two very simple cameras with 0.3 MP (640x480 pixels) on the front for video chat and telephony, and 2.0 MP (1600x1200 pixels) on the back in the top left corner for photographs. 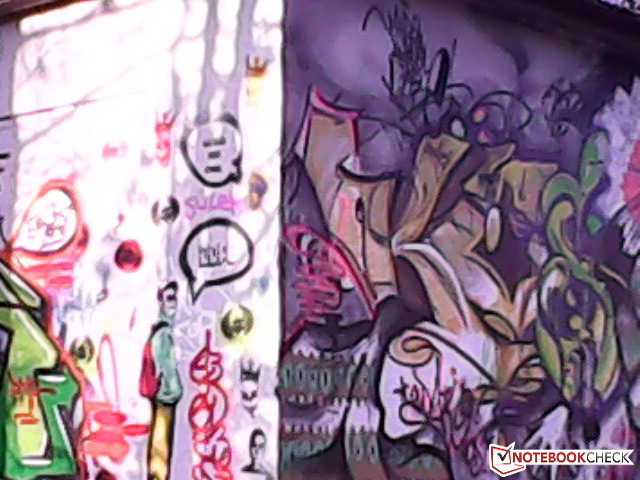 The image quality of the cameras is expectedly humble. We used a stand outdoors and fastened the tablet securely in order to prevent any movements affecting the pictures. Despite the very good lighting conditions, the photographs taken with the camera on the Prime Duo appeared very "muddy" and don't show any detail. 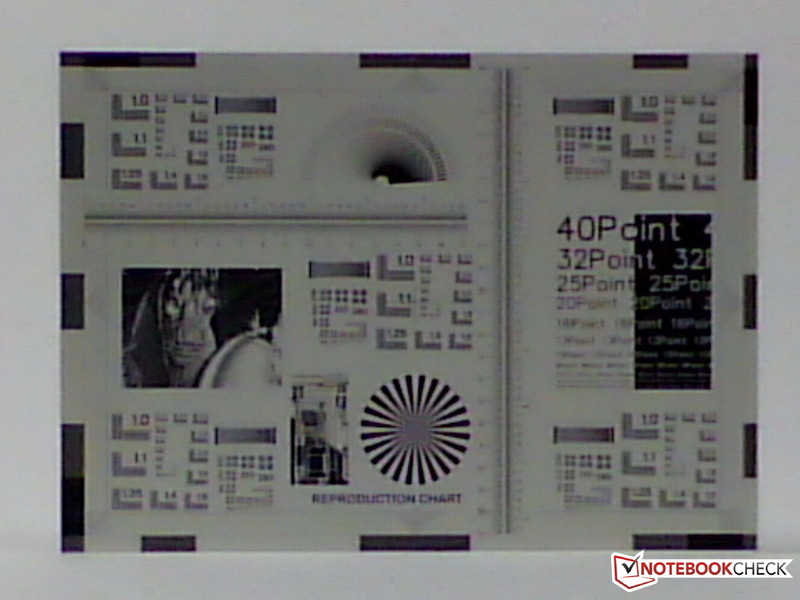 Also with professional lighting in a studio, the test charts show weaknesses in the image quality. 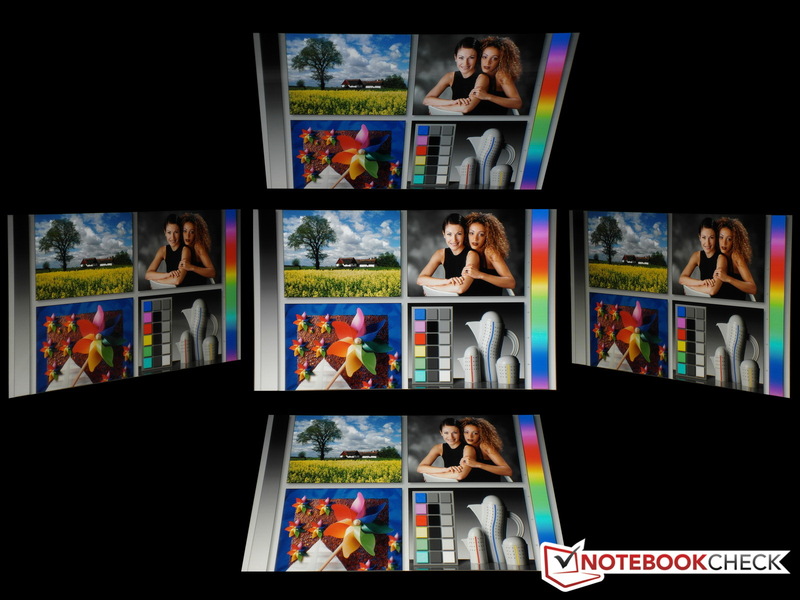 Videos are also recorded with a juddery 640x480 pixel quality with the back camera. Prestigio know how to sell themselves. 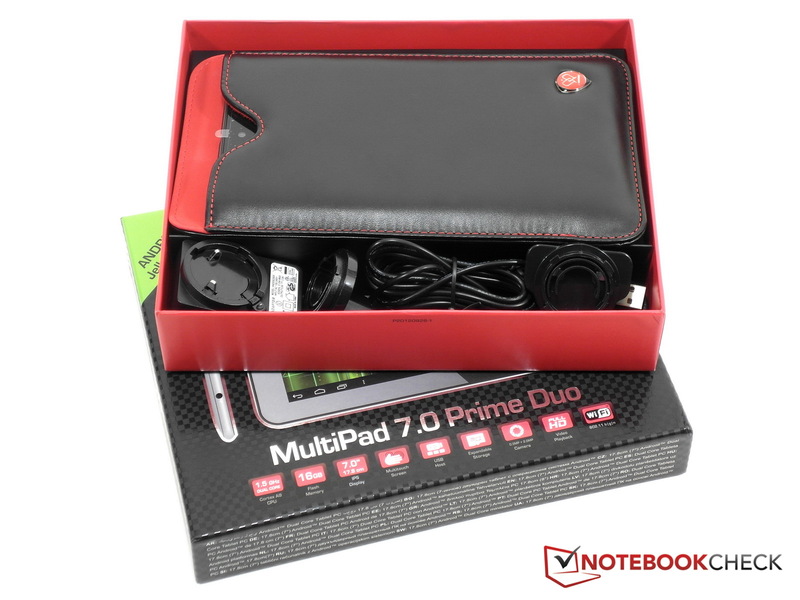 Starting from the packaging, as with the Prestigio MultiPad PMP5080B, the new 7-inch MultiPad 7.0 Prime Duo also comes in the typical Prestigio red and black packaging with a carbon design. Also when it comes to the other accessories Prestigio hasn't cut any corners. 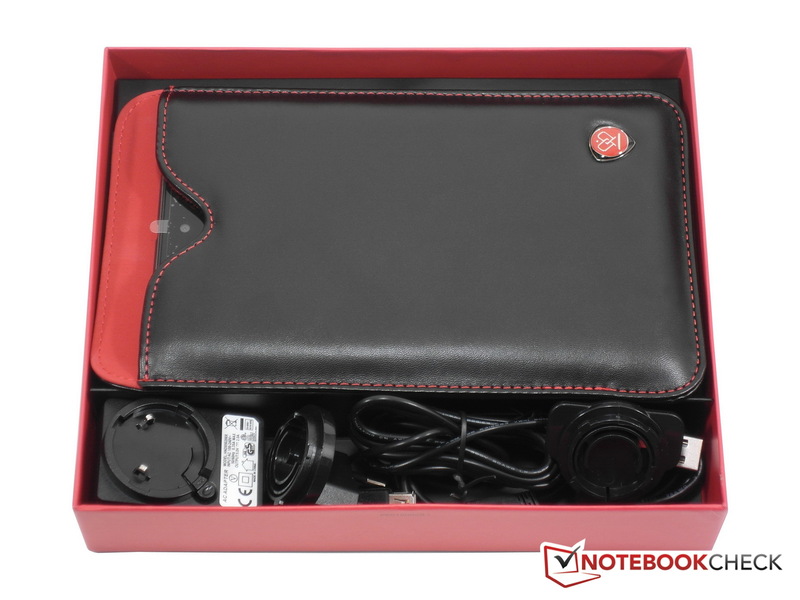 A black case made of high quality leather with red decorative seams and the Prestigio crest with a crown is also included with the delivery. 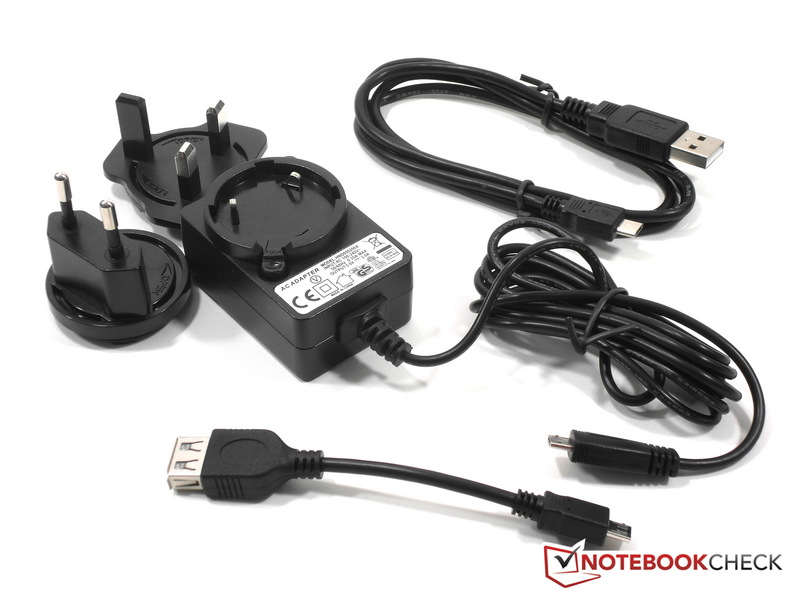 Moreover there is also a USB adapter cable, OTG cable and a 2A, 5-Volt AC adapter. The user guide is installed on the tablet. 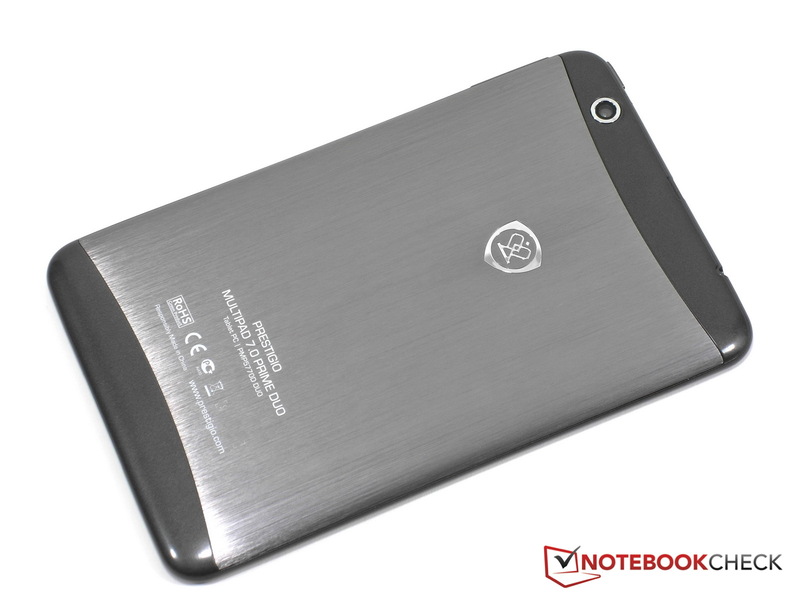 Especially in Eastern Europe the brand Prestigio was able to make a "good name" for itself over the last few years thanks to its affordable multimedia and navigation devices. In the meantime Prestigio has also started to build a satisfied customer base in this country with a series of solid devices with decent service and regular firmware updates. The bottom line: Prestigio believe in the quality of their products. 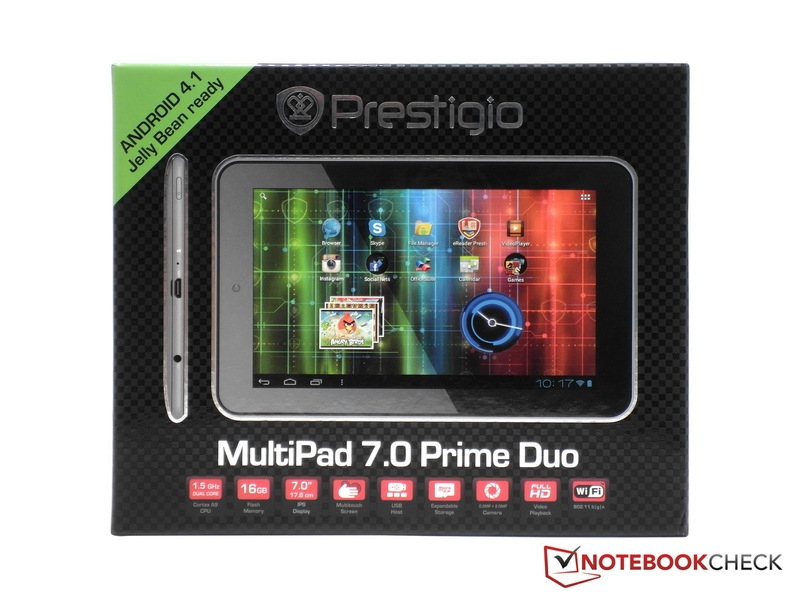 A 2-year warranty is granted for the Prestigio MultiPad 7.0 Prime Duo. Inside the MultiPad 7.0 Prime Duo the application processor AML8726-MX from Amlogic is working away. As a GPU the Mali-400 MP2 is in use in this case. Other chipsets, such as the TI OMAP 4430 for example use a PowerVR SGX 540, Qualcomm's MSM8260 uses an Adreno 220, and Nvidia uses its GeForce ULP in the Tegra 2 and the Tegra 3. Both of the Mail-400 GPU cores in the AML8726-MX have a clock speed of 300 to 400 MHz. The graphics and gaming performance is easily sufficient for simple games, such as the classic Angry Birds or the freeware first person shooter Contrast Killer 2 from Glu, as well as the slaughter in Hollywood with Zombiewood from Gameloft. Some games, such as GT Racing: Motor Academy Free+ or Brothers in Arms 2 Free+ from Gameloft, however didn't even start properly and refused to work. 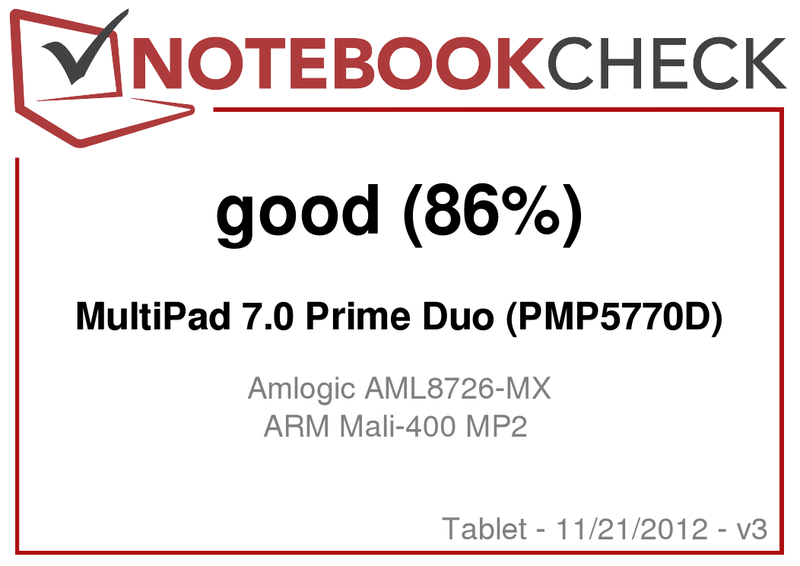 Operation of the MultiPad 7.0 Prime Duo and working with the tablet during our test didn't give any cause for criticism. As physical operating controls two mini switches are sufficient in the instance of the Prestigio PMP5770D: "Power" and "Volume". The remaining control, including the input, takes place via the very agile and responsive 7-inch multi-touchscreen. Whether turning the device, or zooming in or out, or turning pages - touch control and gestures are reliably converted into actions without any noticeable delays. Writing with the Prime Duo takes place via the QWERTY keyboard typical of tablets. In this case we also didn't have any cause for criticism. Following a short getting used to period we got on well with the virtual keyboard. 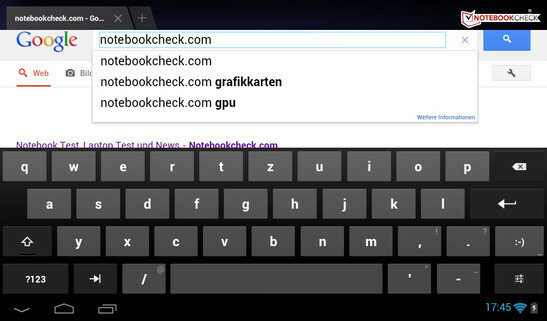 Using this it is also possible to type relatively quickly compared to other Android tablets. Users that value the comfort of an external keyboard are able to attach one to the MultiPad 7.0 via USB without difficulties. The era of drab TN panels with little brightness that have narrow viewing angles are history. Only about a year ago high quality displays with the In-Plane Switching (IPS) technology were usually a reserve of the expensive devices, at least until Amazon and Google et al. paved the way for the improved display technology for entry-level tablets with their affordable devices. 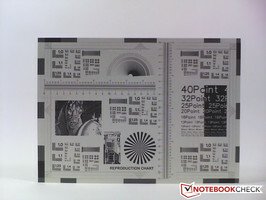 All the popular tablets, such as the Apple iPad Mini, the Kindle Fire and Kindle Fire HD from Amazon, or the Nexus 7 from Google, as well as the PlayBook from RIMs BlackBerry, use IPS displays. 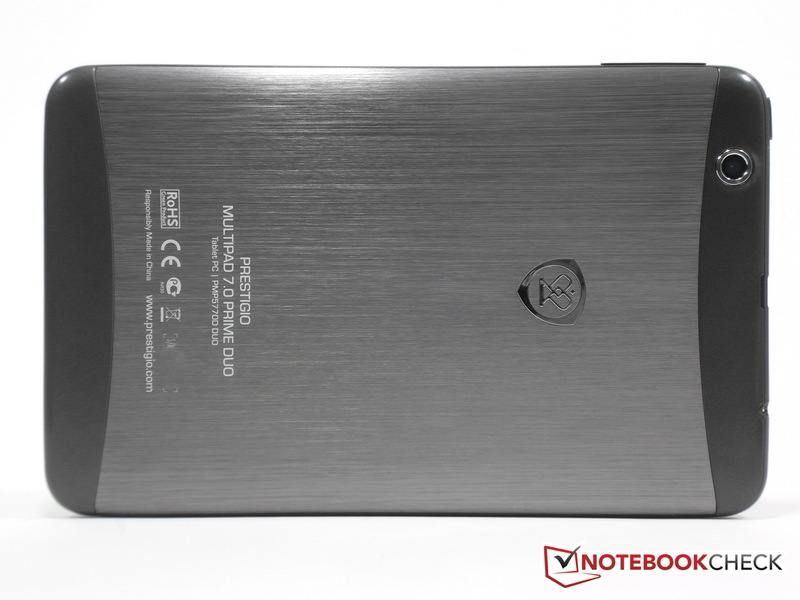 Also the Prestigio MultiPad 7.0 Prime Duo has a reflective 7-inch IPS display which has a native resolution of 1024x600 pixels with an aspect ratio of 16:10. 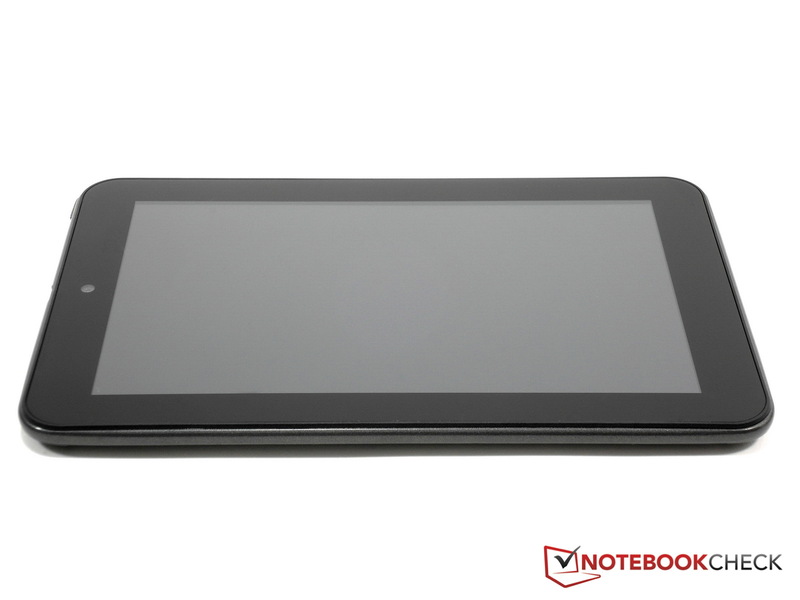 Thus the PMP5770D aligns itself with renowned names such as the BlackBerry PlayBook, the Kindle Fire from Amazon, the Lenovo IdeaPad A2107A and the Samsung Galaxy Tab 7.0 Plus N, in terms of the display. There are however a series of tablets available that provide an even higher resolution in the price segment up to 200 Euros (~$260). 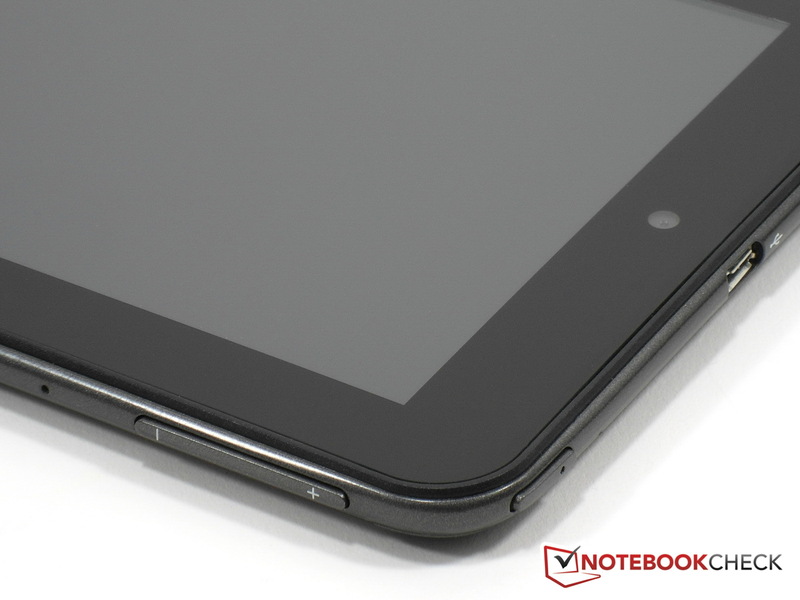 The Kindle Fire HD and the Nexus 7 already have a resolution of 1280x800 pixels. Apple's "Premium Tablet" iPad Mini meanwhile only has a resolution of 1024x768 pixels. ... this is also the case with tablets from the competition. Subjectively and visually, as well as objectively as confirmed by the measurements, the Prime Duo has a great display for this price segment. During the 9 zone brightness measurement made with the professional brightness measurement device Mavo Monitor USB, we determined a maximum brightness level in the left middle area of 306 cd/m². For the black level we determined a value of 0.30 cd/m². The contrast ratio of the Prime Duo display meanwhile lies at around 1017:1 - an exceptionally good value - and not only in this price segment. Even substantially more expensive tablets, such as the iPad Mini, don't measure up to this. Also in terms of the display brightness the Prime Duo is on an equally good level as the Nexus 7, and also provides a very decent result in the test laboratory with its average brightness of 300 cd/m². Outdoors on a sunny day the current contenders in the 200 Euro segment start to converge however, since all the displays of popular entry-level tablets are unfortunately just too reflective. Either users will have to try to find some shade, or use a BlackBerry PlayBook with almost 500 cd/m². ... as are the other displays on tablets in this price segment. 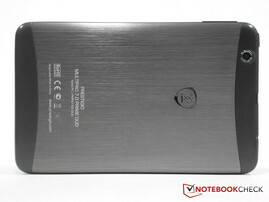 Viewing angles Prestigio MultiPad 7.0 Prime Duo (PMP5770D). The possible viewing angles for the Prime Duo are very good from every position. The 7-inch IPS display also benefits subjectively from the high contrast, and makes a very sharp impression with brilliant and lush colors. When watching videos and playing games the streak free presentation also stands out, even during especially fast movie or gaming sequences. Among the tablets up to 150 Euros (~$195) there is currently no better display. 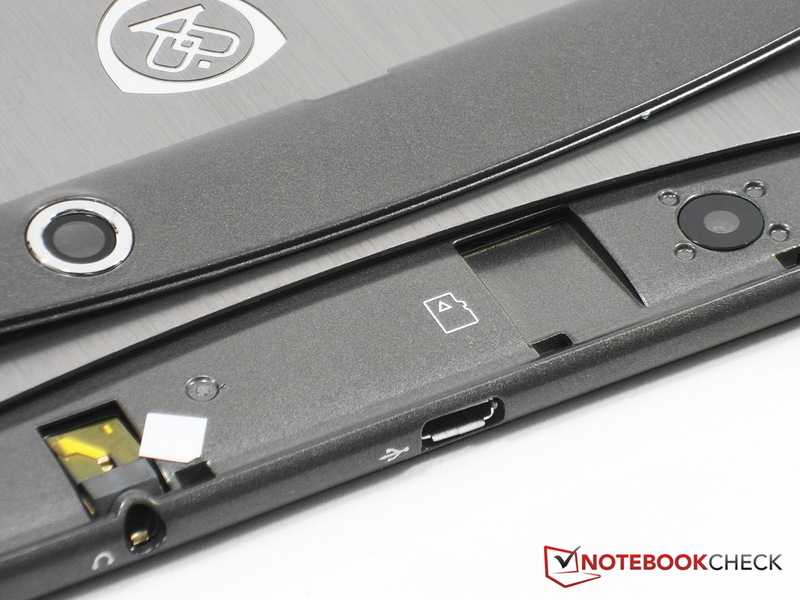 Inside the Prestigio MultiPad 7.0 Prime Duo (PMP5770D) there is a 1.5 GHz clocked dual-core ARM Cortex-A9 MPCore based Amlogic AML8726-MX with a NEON media coprocessor and Mali-400 MP2 GPU at work. The Amlogic AML8726-MX is made using the 40 nm manufacturing process, has 512 KB of L2 cache and supports DDR3 and 1080p Full-HD decoding. Amlogic’s AML8726-MX is currently being used in several white-label tablets from Asia, such as the Coby Kyros MID1060 and MID1065 as well as the cmx MID Aquila 080-1008. The GPU component of the Amlogic AML8726-MX is clocked at 400 MHz. Amlogic's AML8726-MX is a typical example of popular ARM Cortex-A9 based dual-core processors. Direct competitors which can also be commonly found in this country include the 45 nm manufactured SoCs; Apple A5/A5X (1 GHz, 1 MB L2 cache), Samsung Exynos 4210 (1.4 GHz, 1 MB L2 cache), TI OMAP 4430 (1 GHz, 1 MB L2 cache), TI OMAP 4460 (1.5 GHz, 1 MB L2 cache) as well as the 40 nm chips Nvidia Tegra 2 (1 GHz, 1MB L2 cache) and Rockchip RK3066 (1.6 GHz, 512 KB L2 cache). The GPU part of these SoCs is ARMs Mali-400 MP4 clocked at 400 MHz (Exynos 4210, RK3066), Imagination Technologies’ PowerVR SGX 540 (OMAP 4430: 300 MHz | OMAP 4460: 384 MHz), PowerVR SGX 543 MP2 or PowerVR SGX 543 MP with 250 MHz (A5 and A5X). Nvidia's Tegra 2 operates using the GeForce ULP at 300 MHz. All current chips thankfully don't have any problems handling Full HD video anymore thanks to hardware acceleration. Also, as far as Android is concerned, all the tablets run very smoothly and stably using Android 4.0 Ice Cream Sandwich: Something that also applies to the MultiPad 7.0 Prime Duo from Prestigio. The all round performance of the Prime Duo is very decent when considering the affordable price tag of around 150 Euros (~$195). During the test the ICS tablet appeared to be adequately powered in all usage scenarios. Performance deficiencies weren't found in the case of the Prime Duo. In order to compare the performance of the MultiPad 7.0 with other Android tablets and their various processors - with the usual variation of results using synthetic benchmarks in Android - we have also chased the MultiPad PMP5770D through the usual benchmark obstacle course. The detailed results can be found in the benchmark overview below. A short summary at this point: In Geekbench 2 Total Score the Amlogic AML8726-MX has to let its quad-core competitors, such as Nvidia's Tegra 3 and thus also the Google Nexus 7, race ahead substantially with 1000 points. Also Amazon's Kindle Fire HD with an OMAP 4460 is somewhat faster. On the other hand the Prime Duo is still faster than Apple's iPad Mini and iPad 3. 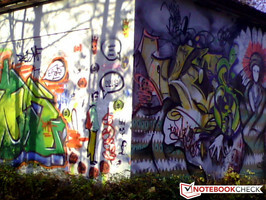 With AndroBench 3 the Prime Duo dominates with very good scores for Random Read and Write memory operations. In AnTuTu benchmark v2 Total Score the MultiPad manages to score a value of 7933, and thus gets ahead of the Kindle Fire HD with TI’s OMAP 4460, while falling behind the Nexus 7 with its Tegra 3. With Rightware's Gaming Benchmark Basemark ES 2.0 for checking the gaming performance with OpenGL ES 2.0, the AML8726-MX in the Prime Duo outperforms the Tegra and OMAP chips with 24.1 fps. We measured the temperature characteristics of the MultiPad 7.0 Prime Duo with an ambient temperature of 23.5 °C (~74.3 °F). In this case the 7-inch Android tablet from Prestigio shows two faces. In an idle state with a low utilization, the Prime Duo remains very inconspicuous with temperatures between 26 and a maximum of 32.9 °C (~78.8 and 91.2 °F). In case the battery is also charged while the tablet is used, then there is an additional slight warming noticeable in the left area around the interfaces. During practical daily use, including surfing the web and visiting Facebook and YouTube, the MultiPad stays lukewarm at all times though. During our stress test with the app Stability Test and the simultaneous utilization of the CPU and GPU, the Prime Duo heats up to a noticeable 33.9 °C (~93.0 °F) on the front and 38.4 °C (~101.1 °F) on the back. In the area around the application processor we were able to measure the maximum temperature of 44.2 °C (~111.6 °F). 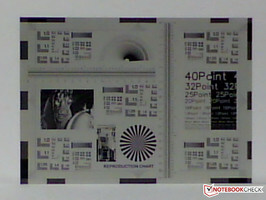 This is already relatively hot, but also represents the heat dissipation of the core components via the aluminum panel. For the sake of comparison, the Apple iPad Mini (33.4 °C / ~92.1 °F), Kindle Fire (32 °C / ~89.6 °F), Nexus 7 (38.8 °C / ~101.8 °F) and the PlayBook (37.5 °C / ~99.5 °F) stay significantly cooler than the Prestigio tablet. The AC adapter only heats up to a mere 41 °C (~105.8 °F), even when fully utilized. (±) The average temperature for the upper side under maximal load is 33.8 °C / 93 F, compared to the average of 30.7 °C / 87 F for the devices in the class Tablet. (+) The maximum temperature on the upper side is 39.9 °C / 104 F, compared to the average of 34.8 °C / 95 F, ranging from 22.2 to 51.8 °C for the class Tablet. The Prestigio MultiPad has two small stereo speakers integrated on the shorter right side of the Prime Duo. 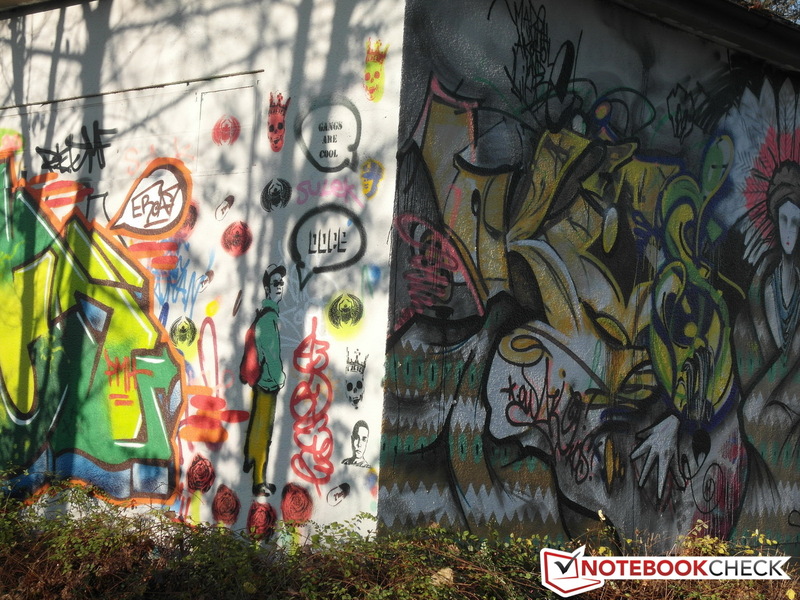 The location is more or less the same as that on the Apple iPad Mini. With videos and movies using the landscape layout, the sound therefore only comes from the right hand side. But also watching with a portrait layout a stereo sound can only be imagined - it certainly can't be heard. As usual in this price segment, the integrated audio transducers are only suitable for basic less demanding audio quality. The 3.5 mm mini jack socket on the other hand delivers a good sound quality combined with a decent pair of headphones. Since the lithium-polymer battery with 11.84 Wh (3200 mAh, 3.7V) in the MultiPad PMP5770D is firmly attached, and can only be removed by taking apart the whole tablet, it remained in the device during the power consumption measurements. Also worth pointing out is that some of the results could be slightly misleading, since we were only able to take measurements from the power source and power input without a detailed knowledge of the relevant circuitry. Altogether the MultiPad 7.0 Prime Duo didn't present itself as very power-hungry during our power and battery life measurements. The power consumption remained at below 3 Watts in an idle state, while rising to 7.4 Watts with maximum utilization, which still leaves it within the range of other tablets in its class. [Addendum 27.11. ]: As can be seen in the figure below depicting the power consumption, the Prime Duo tablet also uses power in a switched off state when the tablet is connected to the AC adapter. This is also the case when in standby mode. Prestigio has been informed of these findings and is working on a solution. If the USB port is not used (no charging device, USB device etc. ), then there is no significant "self discharge" of the battery according to our supplementary test. After 3 days in a switched off state the previously fully charged battery was still 100 percent charged. 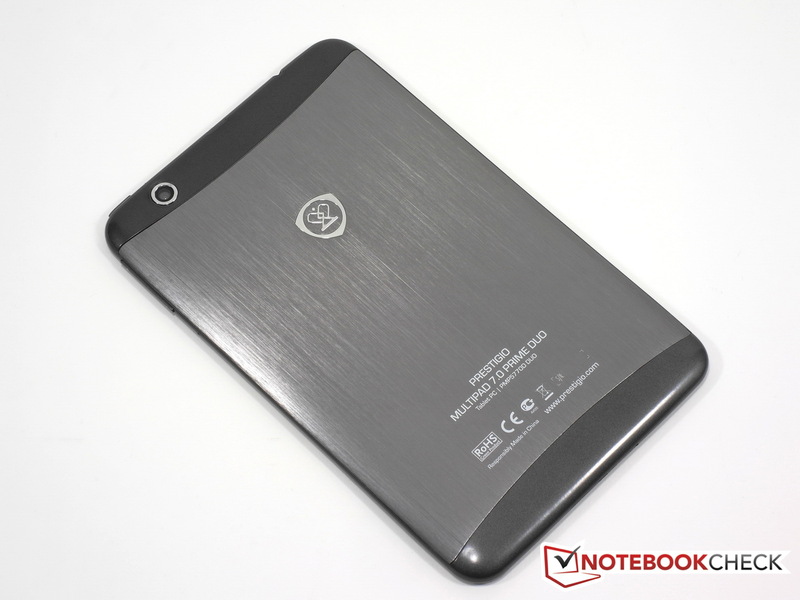 Prestigio promises a battery life of up to 4 hours while playing back videos. 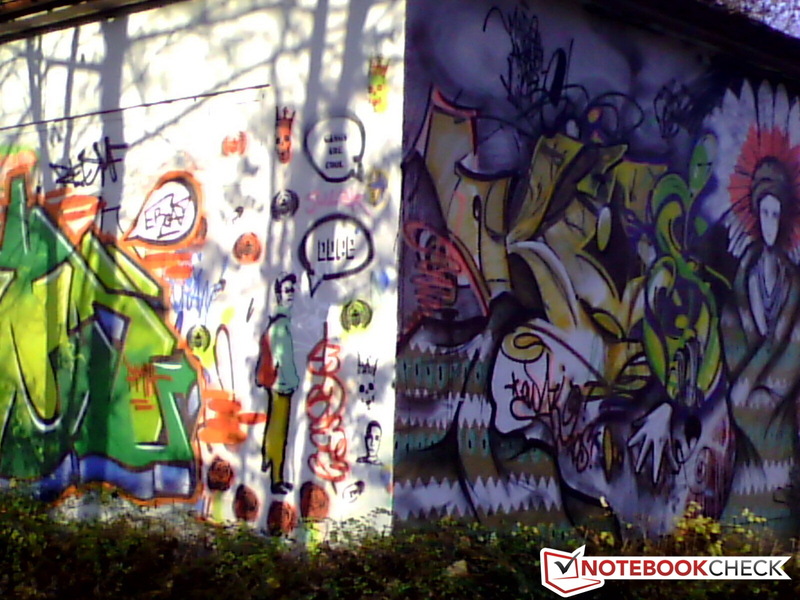 This is just about achieved during our test with the MultiPad 7.0 Prime Duo. In the instance of "surfing via WLAN" without continuous video playback, and with the WLAN enabled while the display brightness is set to a reduced 150 cd/m², the MultiPad manages to stay on its feet for 4 hours and 13 minutes while loading a standardized website script. For the sake of comparison: The Google Nexus 7 meanwhile manages a longer 6 hours and 50 minutes with the same conditions, while the Kindle Fire from Amazon comes to about 6 hours. In an idle state with the WLAN enabled and the brightness set to its minimum, the Prime Duo switches off after 5 hours and 34 minutes during the Reader’s Test. With the CPU and GPU fully utilized, and the WLAN enabled while the display brightness is at its maximum, the MultiPad managed 2 hours and 31 minutes in the Stability Test. The battery life certainly doesn't belong among the strengths of the MultiPad. 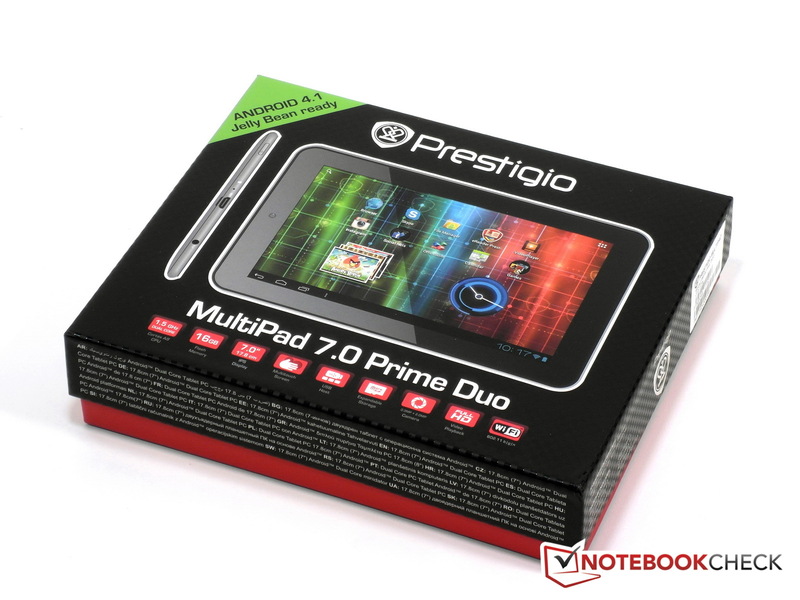 Prestigio is providing a good all round package for the tablet PC segment under 200 Euros (~$260) with the 7-inch MultiPad 7.0 Prime Duo (PMP5770D). 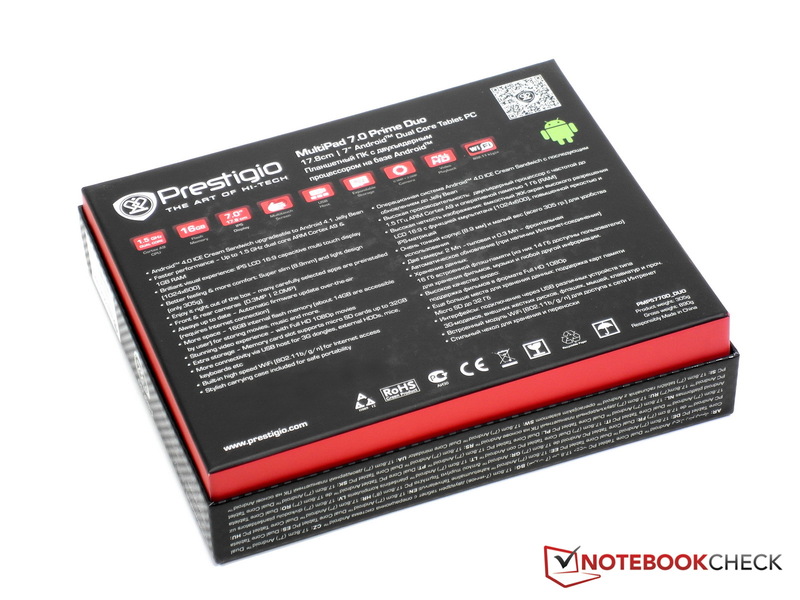 Those looking for an insider tip among the value for money entry-level tablets (150 Euros/~$195) with Android 4.0 Ice Cream Sandwich should consider the full access to the Google Play store, the thin and light body, the good quality case, as well as the exceptional IPS display featured in the Prime Duo from Prestigio. Buyers will have to be able to make do with a battery life of around 4 hours though. In our test the Prestigio MultiPad managed to primarily score points when it came to its dimensions, weight and manufacturing quality, as well as the rating for the display. 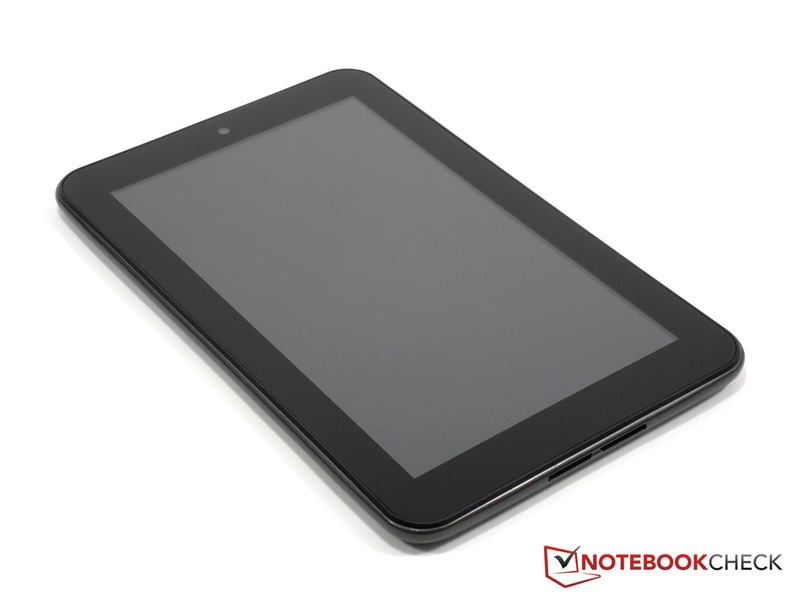 In this case the MultiPad 7.0 is able to easily contend with more expensive tablets, such as the Kindle Fire and the Nexus 7. Especially the sharp and brilliant 7-inch IPS display is a positive surprise in this price segment. Also the all round performance of the processor, graphics and memory provided by the Prime Duo is solid. Setbacks are however encountered by the MultiPad in the test when it comes to the battery life and temperature emissions. In this instance the Prestigio tablet falls considerably behind other 7-inch tablets in the sub 200 Euro (~$260) segment. In the battery test category surfing via WLAN the MultiPad 7.0 managed to stay operational for a little over 4 hours. 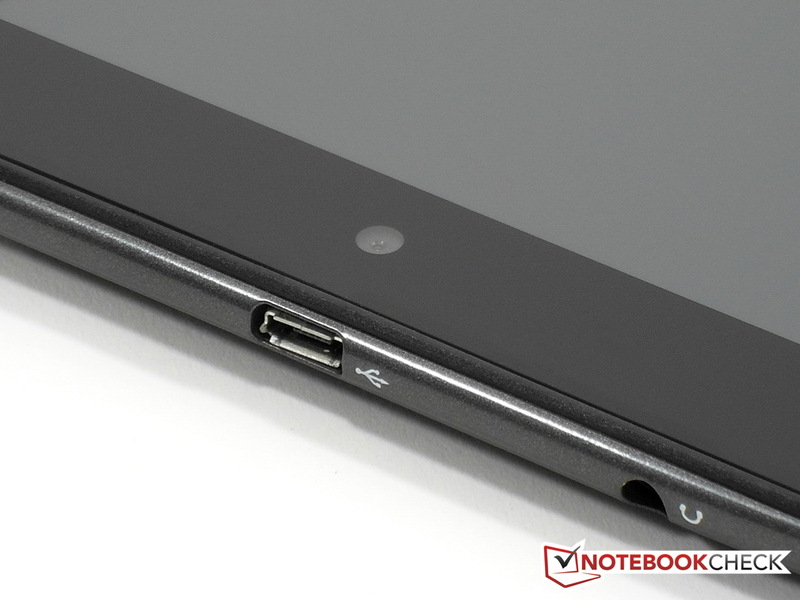 The absent HDMI port meanwhile can currently only be found on more expensive tablets. ... there is no cause for criticism. ... and don't give us any reason to complain. The MultiPad 7.0 Prime Duo is very thin at 8.9 millimeters. ... the cover over the main camera has to be removed. 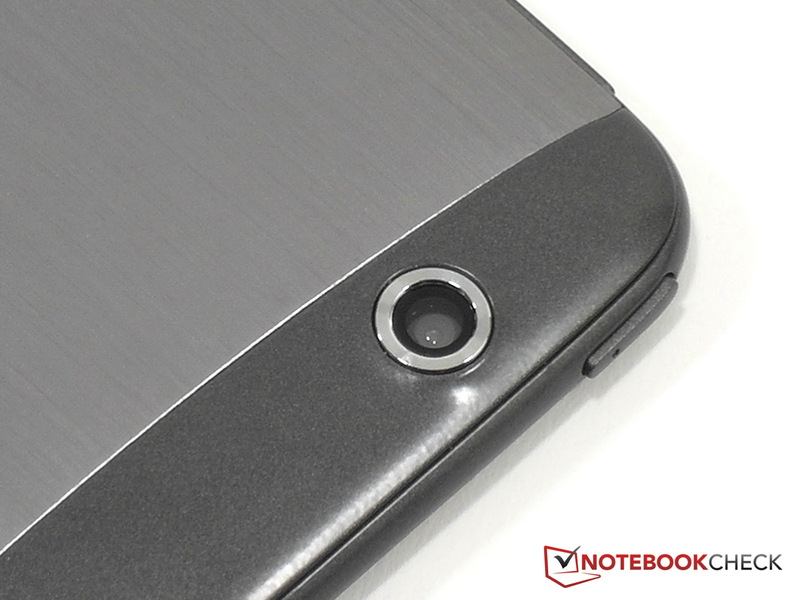 Here is the headphone socket and the microSD slot. Power adapter with adapters, OTG cable and USB cable. Quick Start manual and safety information. ... the Archos 101 G9. ... make for a good all around package. ... with a red and black carbon design. The PMP5770D is suitable for Android 4.1 Jelly Bean according to Prestigio. ... high quality leather case. 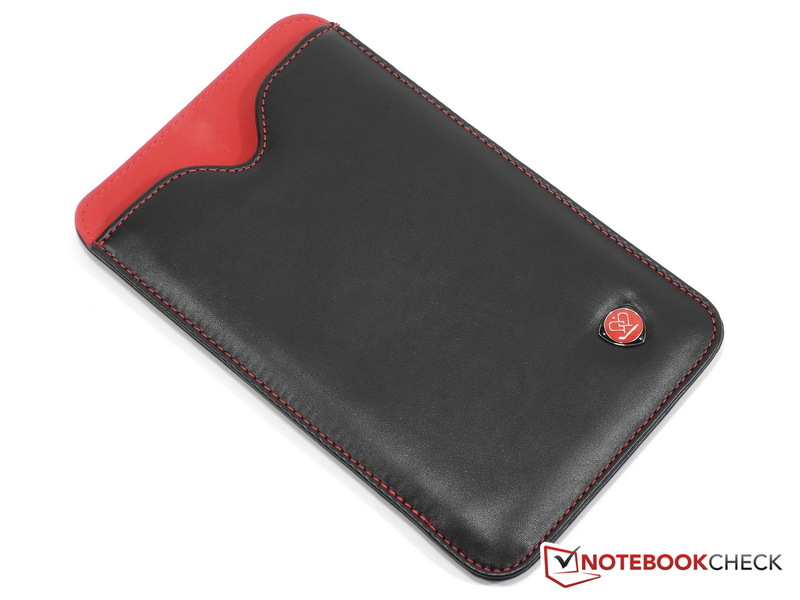 The leather sleeve provides the tablet with perfect protection. Unfortunately only for transportation and not for the display. ... has a cool aluminum panel. ... of the components is good. The price. 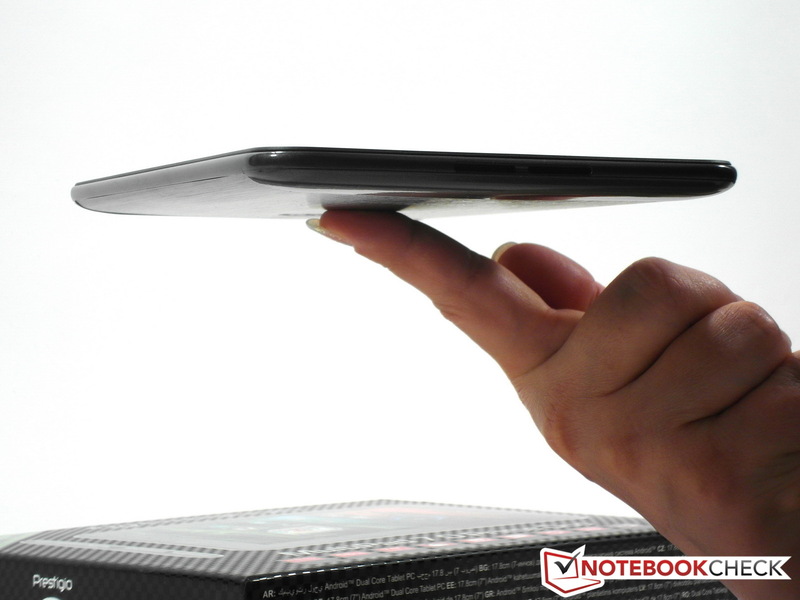 In addition one of the thinnest and lightest 7-inch tablets. Good design, good quality and solidly manufactured. The IPS display is brilliant, bright, very homogenous and extra sharp. Bingo. For 150 Euros a more brilliant and brighter display than that on the Google Nexus 7. On the scales level with the iPad Mini from Apple. Contrary to Amazon's Kindle Fire with full access to the Google Play store. More expensive. But the Google Nexus 7 also provides GPS, NFC, Bluetooth and a display with a higher resolution. The Kindle Fire is brighter, and the Kindle Fire HD has a 1280 resolution plus HDMI. RIMs BlackBerry PlayBook is in its own universe. 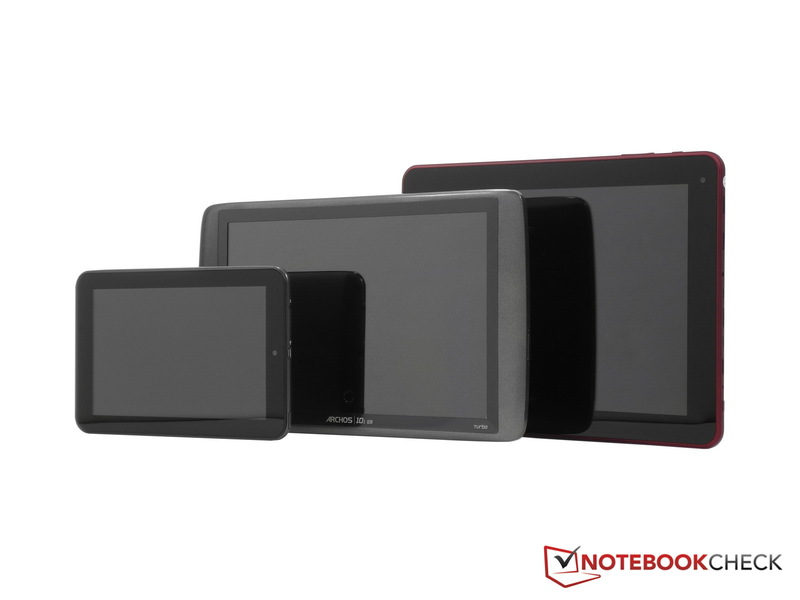 The Android tablets from Archos, Arnova, Coby, Odys and cmx.